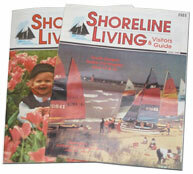 Group Tour Media began in 1980 with the publication of Shoreline Living & Visitors Guide, a magazine directed at showcasing West Michigan festivals, events, and businesses to thousands of area visitors. Two years later, the services of Group Tour Media were expanded to include the publishing of brochures and promotional materials. Following this expansion, a sideline motorcoach charter business was formed. Founder Carl Wassink and a partner purchased a few buses and developed a bus company named Tulip City Charters. At this time the insurance industry was going through a crisis with huge rate increases and Carl was driving the buses every weekend. Through his travels he noticed a need for more and better information for the group tour planner. This realization inspired Carl to sell his motorcoach business and expand the publishing company. In 1987 the first edition of Michigan Group Tour Magazine was published. The 3,800 copies of the 16-page magazine, printed on tabloid-sized newsprint, were distributed nationwide. Shortly thereafter, Wisconsin Group Tour Magazine was launched. Both publications proved to be successful! A plan was established to cover the United States and Canada by means of regional editions within five years. Today, this plan has become a reality. Group Tour Magazine is currently publishing three editions: Western U.S. & Canada, Southeastern, and Northeast, The Heartland & Canada. This success enabled Group Tour Media to launch its annual Industry Update magazine in 1998 with its first roundtable discussion. In 1997, the company purchased STRAC, a West Coast group leader trade show. In January 2000, Group Tour Media launched Group Travel Lifestyles magazine. In March 2000, Group Tour Media was named the 14th-fastest growing publishing company by FOLIO Magazine. With continued success and changing industry trends, Group Tour Media’s vision continued to grow. In 2005, Group Tour Media took the company’s vast publishing experience and created its newest publication, Student Group Tour Magazine. With the growth of student travel, supplying tour planners, and educators with ideas for student destinations and attractions was a logical step. Today, Group Tour Media has 20 employees as well as independent representatives selling products across North America. Twenty-eight years after its inception, Group Tour Media creates the most widely distributed publications in the group travel industry, and has worldwide exposure through GroupTourMedia.com.